The interactive web app Selfiexploratory allows you to navigate the complete set of 3840 photos. Theoretical essays place selfies in the context of history of photography, analyze the functions of images in social media in general, and discuss our methods and dataset. Designing Knowledge, ACMSIGGRAPH Digital Arts Community 2017 Online Exhibition (within the framework of SIGGRAPH ASIA 2017, Bangkok, Thailand), 2017-2018. #Me. From Self-portrait to Selfie, National Museum of Photography, Norway, October 2, 2016 - March 12, 2017 (Selfiecity London). Big Bang Data, Somerset House London, December 2, 2015 - February 28, 2016 (Selfiecity London). The 2nd Annual Filmatic Festival , UC San Diego, La Jolla, April 30 - May 2, 2015. Selfiecity is one of the Top 12 Best Data Visualizations of All Time (June 2017). Selfiecity received the Golden Award in the Website category of the Kantar Information is Beautiful 2014 Awards competition (November 12, 2014). Selfiecity is among 15 Data Visualizations That Will Blow Your Mind 2015 Awards. 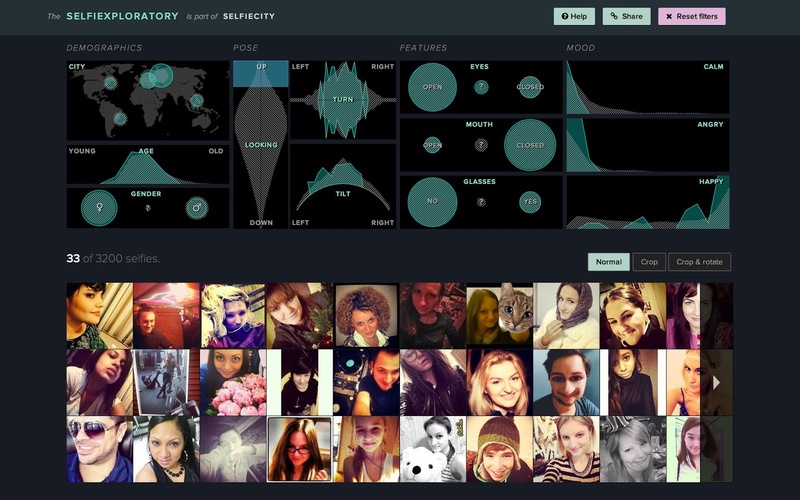 Selfiecity is one of the Best Projects in Data Visualization of 2014 according to a list by the Social Technologies Hothouse (December 26, 2014). The project appears on the list of top 100 Interactive visualizations of 2014: Projects that made this year one of the most inspiring in the data viz field by Visualoop (December 26, 2014). The project website is featured in Best of 2014: The Year in Selfies on The Creators Project (December 26, 2014). Selfiecity is among The Best Data Visualizations of 2014 by Gizmodo (December 24, 2014). 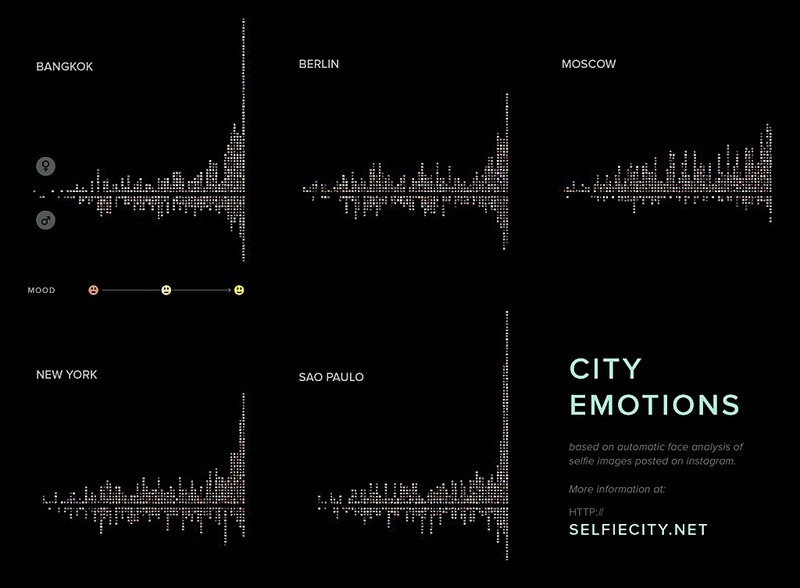 Selfiecity is one of The Best Data Visualization Projects of 2014 according to Dr. Nathan Yau at Flowing Data (December 19, 2014).